F Simple and Serene Living: could it be? Yes, the daffodils are up and blooming. A sure sign of spring. The Shabby Apple $50 gift certificate giveaway is still going on through Sunday night on my blog. Click here to enter. How pretty. I wish our daffs were up. Still a ways to go for spring here I think. My daffodils are under 2' of snow, but I LOVE that poem. It is so true. Especially in May through October, I try to memorize the look of every beautiful thing here in NW Wisconsin. (It's too easy to remember winter.) lol And oh do I love that photo of the chickens among the daffodils!! Wish I could be dancing with the daffodils. I went out with my camera, searching for a sign of Spring, but all I found was some melting snow and a LOT of mud :-(. 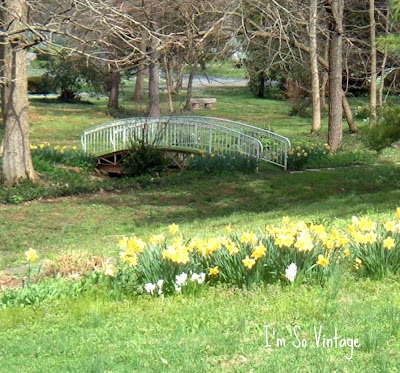 Coming over from Preppy Empty Nester :) Such a pretty blog and I too love daffodils (and tulips at this time of year!) The chickens are darling and perfect for spring. We have baby chicks for sale at our near by Grange store (animal feed supply). I don't dare go in because I may bring a couple home! Laura... what gorgeous images. I was so excited - It was 82 degrees here in Texas. The nurseries were packed. Can't wait to start planting! Have a wonderful weekend. Love the pic of the roosters especially! I love the poem and the beautiful images the one with the daffodils in the window is my favorite. They are a beautiful sign of Spring! Happy weekend, my friend! They are always the first sign of spring her on our farm. Beautiful poem. Yes, it is a beautiful sight!! Tiny smiley faces this time of the year! Spring for sure with lots and lots of daffodils! I love the poem and the pretty photos of the daffodils. Wish we were seeing some here, but we still have snow on the ground. How nice! No flowers here yet, but the daffs are up-- about 4" tall.